Kevin Smith may be retiring from filmmaking after his upcoming hockey comedy Hit Somebody, yet not even this is enough to stop Smith from revisiting Clerks at least one more time. 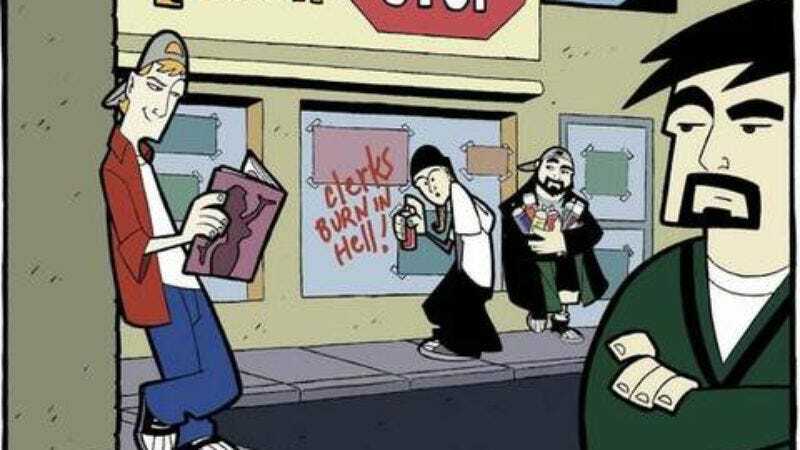 According to his Twitter feed (as picked up by MTV), Smith is currently working with the slowly rebuilding Miramax on possibly resurrecting the quickly canceled yet still cultishly adored Clerks: The Animated Series for another batch of episodes in 2013. “Miramax 2.0 and I are hoping to give you new eps weekly next year,” Smith said of reviving the pop-addled show that lasted only two episodes on ABC in 2000 before being shelved, only to find a robust second life on DVD, as well as in the constant references of those who own that DVD. The new information stops there, though it's not unlikely that Smith 2.0—you know, that guy who recently railed against traditional forms of distribution and so forth—might be interested in doing it through something like Netflix, Hulu, or even his own website. (In the meantime, of course, the original is still all over YouTube.) You may now begin petitioning Alec Baldwin on Twitter to reprise his role as Leonardo Leonardo.